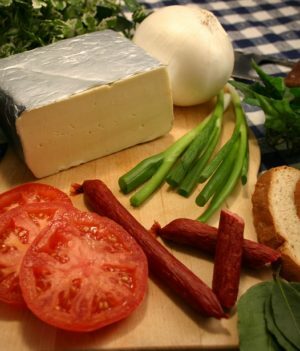 Havarti Cheese or Cream Havarti (Fløde Havarti in Danish) is a semi-soft Danish cow’s milk cheese. 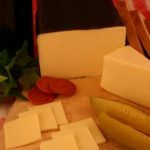 It is a table cheese that can be sliced, grilled, or melted. 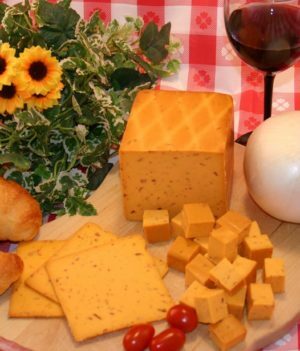 Havarti Cheese is made like most cheeses, by introducing rennet to milk to cause curdling. The curds are pressed into cheese molds which are drained, and then the cheese is aged. Havarti is a washed curd cheese, which contributes to the subtle flavor of the cheese. 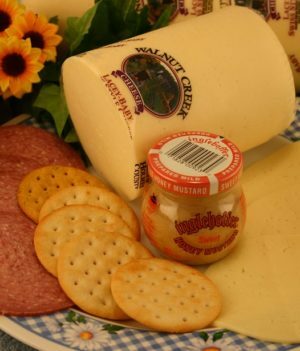 Havarti Cheese is an interior-ripened cheese that is rindless, smooth and slightly bright-surfaced with a cream to yellow color depending on type. It has very small and irregular openings (“eyes”) distributed in the mass. Havarti Cheese has a buttery aroma and can be somewhat sharp in the stronger varieties, much like Swiss cheese. 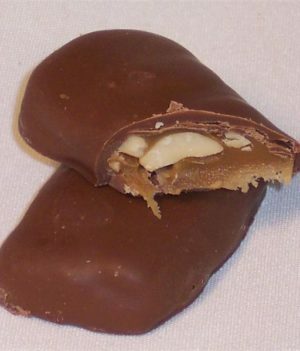 The taste is buttery, and from somewhat sweet to very sweet, and it is slightly acidic. It is typically aged about three months, though when Havarti Cheese is older it becomes more salty and tastes like hazelnut. When left at room temperature the cheese tends to soften quickly. 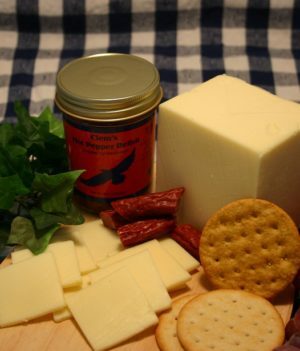 This variation of Havarti Cheese is infused with Caraway Fruits, commonly referred to as Caraway seeds, which are the principle element in the flavor of rye bread. The result is a pungent anise-like flavor and aroma combined with the rich and buttery flavor of Havarti Cheese. 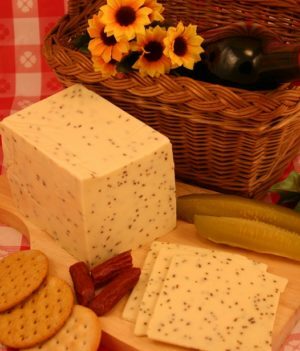 Plain Havarti Cheese and Havarti Cheese with Dill are also available. 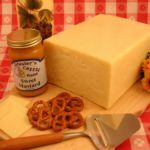 Havarti is also very similar in texture and flavor to our locally made Amish Butter Cheese. 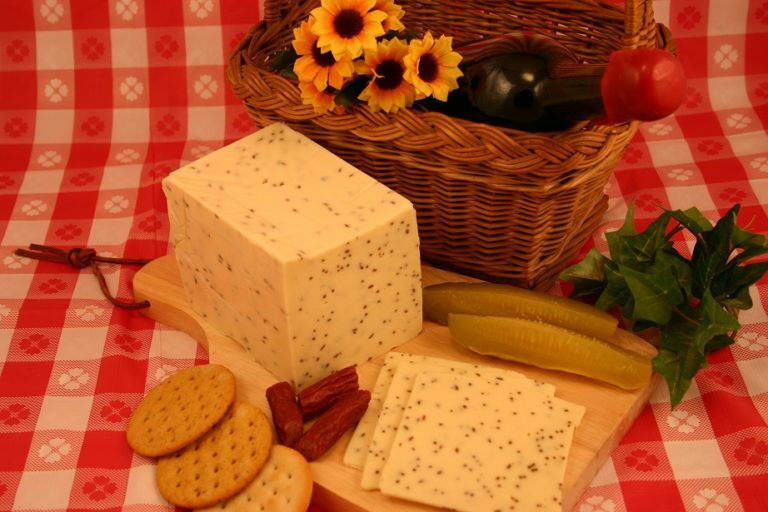 Havarti cheese was initially created by Hanne Nielsen who operated an experimental farm called Havarthigaard, in Øverød, north of Copenhagen, in the mid-19th century. 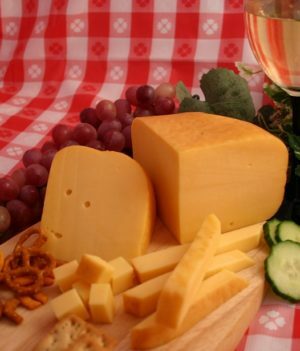 Havarti Cheese Pairs well with several reds including Beaujolais, Cabernet Sauvignon, Pinot Noir, Merlot, and Zinfandel. If you prefer white wine, Sauvignon Blanc pairs well with Havarti Cheese. For beer drinkers, Havarti Cheese is nicely complimented with any Pilsner or Stout.